For the last two years, we’ve worked to make our KAYAK skill for Amazon Alexa more helpful, more useful and, let’s be honest, more fun. In 2016, we launched our skill with the ability to track and search for flights, look for hotels and discover new destinations on your budget. In 2017, we added the ability to book your hotel via voice command and get daily travel tips. Now, in 2018, we’re introducing a new improvement to how you track flights. Say hello to flight notifications for your Alexa-enabled device. No more setting reminders in your calendar or strategically placing post-it notes on your desk saying “PICK GRANDMA UP AT AIRPORT.” With flight notifications for Alexa, you can ask KAYAK to alert you when a flight lands. You can also schedule a notification to go off at a specified time before the flight’s arrival — in case you’re on airport pickup duty. Maybe your sweetie is on their way home and you want to know when their flight lands safely. Or maybe you’re picking up friends at the airport and aren’t sure when you should leave your house. Let KAYAK do the tracking for you, so you can focus on more important things. Wondering what made us so Alexa-obsessed? Here’s the story behind how we got started leading the charge in AI for the travel industry. Not sure if your carry-on will need to be checked? 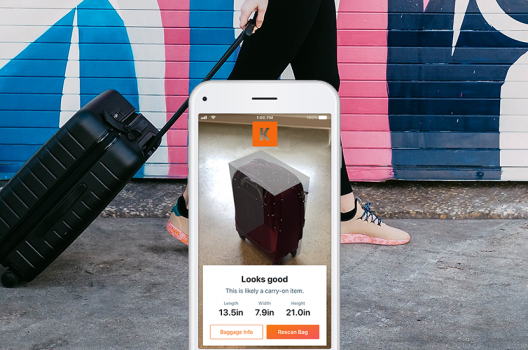 We can let you know before you head to the airport with our augmented reality Bag Measurement Tool.